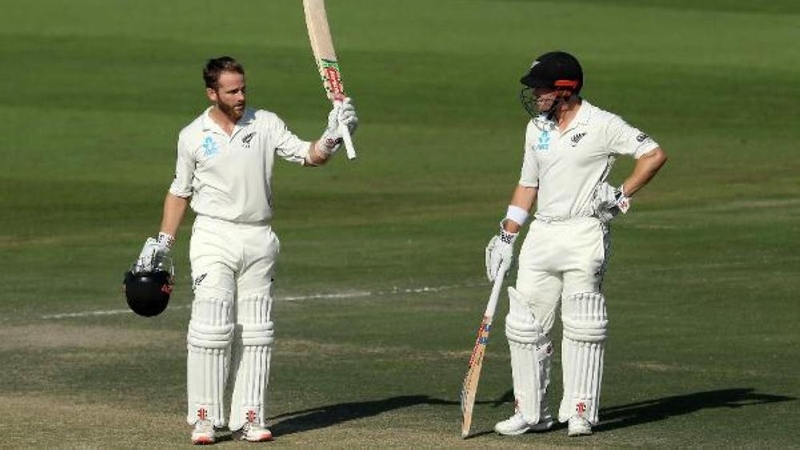 New Zealand skipper Kane Williamson and Henry Nicholls shared a smashing partnership during the third and final Test in Abu Dhabi on Thursday. ABU DHABI — Record-breaking Yasir Shah had to share the day's honors with New Zealand skipper Kane Williamson on Thursday as the third and final Test heads towards a gripping final day in Abu Dhabi. The early part of the morning belonged to Yasir who collected the one wicket he needed to become the fastest man to reach 200 wickets in Test cricket. The rest of the day, however, belonged to Williamson who played a masterly innings, and was 139 not out as the Kiwis reached 272-4 by the close. Williamson had great support from Henry Nicholls who made 90 not out during an unbroken fifth wicket partnership of 212 that has given New Zealand a lead of 198 with six wickets remaining. With the series tied at 1-1, the final day of this last Test promises to be fascinating with both sides capable of winning. The day began in high anticipation with New Zealand resuming at 26-2 and Yasir taking the ball to bowl the third over. He needed just one wicket to break a record set 82 years ago by the great Australian leg-spinner Clarrie Grimmett who had needed 36 Tests to reach the milestone of 200 Test wickets. Pakistan had hopes of an emphatic win once Shaheen Shah Afridi had Ross Taylor caught hooking for 22 with the total at 60-4. But they were undone by Williamson's masterclass and an innings from Nicholls that grew in confidence but, like his partner, enjoyed a touch of luck. Yasir, whose 14 wickets helped Pakistan level the series 1-1 in Dubai, now has 27 wickets in the series. His 14 for 184 were the second best match figures in a Test for Pakistan, behind former captain and current prime minister of Pakistan Imran Khan, who bagged 14 for 116 against Sri Lanka in Lahore in 1982. Bowling: Hasan 13-5-37-0, Shaheen 16-5-55-2, Yasir 37-8-107-2, Asif 36-6-62-0, Azhar 1-0-2-0, Hafeez 1-0-3-0.